Here, you can find all the latest news and information from The George. We will tell you about all that is happening at the moment. Everything from an update on the animals on the smallholding, delicious new local produce coming into season or a new supplier joining our ‘Local Heroes‘ can be found here. The George is a family run restaurant. We have been established for 16 years. Our aim is to use and promote the use of local produce and local businesses. Including our own farm, working alongside Produced in Kent. We are always looking for new local suppliers. 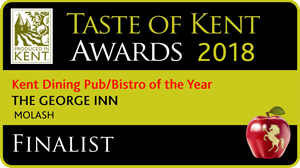 We would like to say a huge thankyou to all of our customers who once again voted for us in the Taste of Kent Awards. We are pleased to announce that for the fifth year in a row we are in the Top Three in our category. From January we are running a new Winter Set Menu. Cutlers Farm is our small holding. We are now in a third year. We now produce our own Pork, Duck and Turkey. This is proving very successful and we hope to add a small flock of Lambs this year. All of the meat produced is for the restaurant. Including our own sausages, Terrine and Brawn. Cutlers Farm comprises of 25 Acres of Pasture and Farmyard and 200 Acres of woodland, where we manage the Deer and supply our own venison. We have taken great pleasure and care selecting our suppliers who bring us their freshest, finest produce. It is for this reason that we have affectionately termed them ‘Local Heroes’. They are the local businesses that make our food and drink what it is – and we thank them for it! Please see the map below to find us – we are only a short drive from Canterbury, Ashford and Faversham.